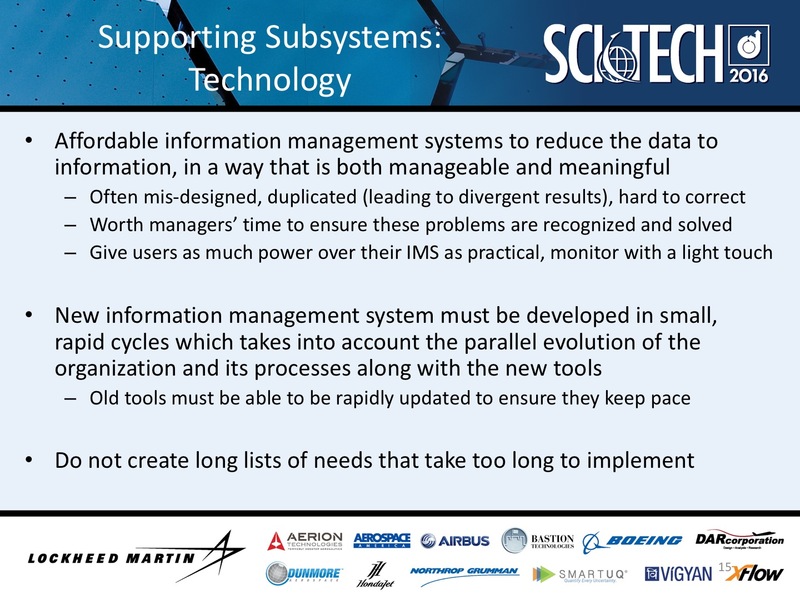 As promised in earlier posts, I continue to expand on the charts posted from my presentation on 5 January at the SciTech Conference in San Diego. Managing your tech tools is one of 3 critical processes to ensure a smooth running sustainment organization. The other two are people and the process that manage your processes. Information management using technical tools too often results in a few massive projects to solve all problems at once with the ONE, FINAL, data system that DOES EVERYTHING. Managers and other leaders quickly see how a proliferation of small spreadsheets creates an inefficient organization and a pool of contradictory information as the spreadsheets are maintained independently. But the solution is not one massive project to create “one ring to rule them all”. This usually leads to wasted resources. Creating all requirements up front works pretty good when building bridges. With real property, it has. over the years, become very straightforward to come up with the right list of requirements with lead time to build a bridge that will serve for decades with minor maintenance. Coming up with requirement for software projects this way is extremely difficult. Software projects that try to create tools for organizations are especially doomed because the organization cannot possibly know its requirements early and they change often. Information systems are built to improve the ability of the organization to function. If successful, the organizational data requirements change because the organization and its processes change in response to the new tools. And then, these changing organization data requirements require changes to the information systems again. It is a never-ending cycle that begs for control from a dedicated team of users and a savvy manager. It is best to start our small and build. Many very successful data systems start as Excel Spreadsheets used by a single person or small team. Then the manager or supervisor works with the team to slowly expand and build the tools in synch with changing processes within the team and organization. Success requires an insightful leader and a focus on the team and organizational processes. This will reveal over time what the information system should look like. By keeping the development and maintenance of the information system in-house, response times decrease and costs can be lower.